Signal-Seeker™ SUMOylation Enrichment Kit (immunoprecipitation format) - Cytoskeleton, Inc.
(A) HAP1 wildtype (WT) or SUMO1 knockout (KO) lysate, was obtained using BlastR lysis and filter system. 1 mg of each lysate were incubated with 40 mg of each SUMO1 affinity reagent: ASM11-beads (Cytoskeleton), 21C7 (Invitrogen—purified), 21C7 (DSHB—supernatant), D11-beads (Santa Cruz) and conjugated SUMO1 IgG control beads (CIG03). 21C7 antibodies were captured with protein G agarose beads to enrich for SUMO-1 modified proteins. Samples were separated by SDS-PAGE and transferred to PVDF. 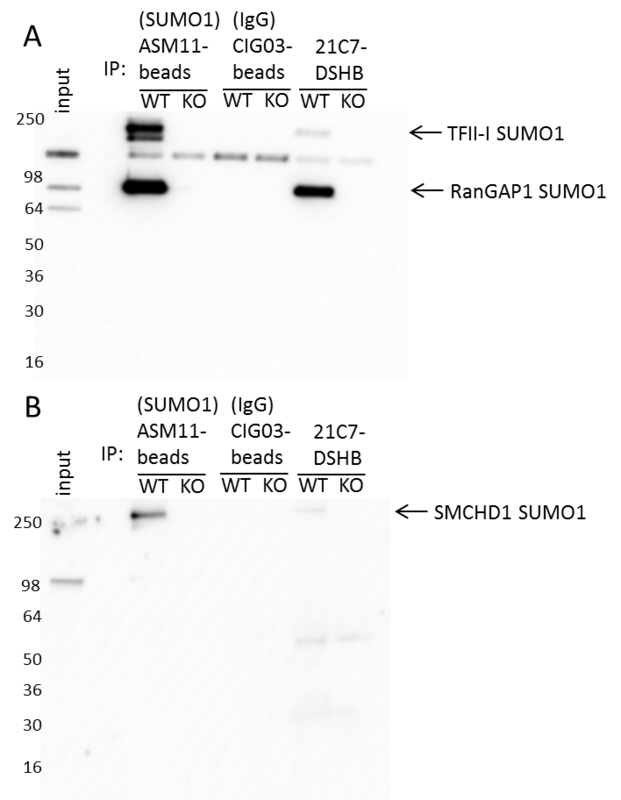 Enriched SUMO1 samples were analyzed by western blot using ASM01 (Cytoskeleton) antibody at 1:5000, and mouse Trubelot Ultra-HRP secondary at 1:1000 in 5% milk. Trueblot secondary was used to minimize heavy and light chain detection from 21C7 samples. (B): IP was performed using ASM11 as in Fig 1A. SUMO1 modified proteins were visualized with ASM01 1:5000, and anti-mouse secondary at 1:20,000 to highlight the profile of SUMOylated proteins in the region between 64-30 kDa that may be masked by heavy and light chain interference when using unconjugated antibodies for IP. HAP1 wildtype (WT) or SUMO1 knockout (KO) lysate, was obtained using BlastR lysis and filter system. 1 mg of each lysate were incubated with 40 mg of each SUMO1 affinity reagent: ASM11-beads (Cytoskeleton), 21C7 (DSHB—supernatant), and conjugated SUMO1 IgG control beads (CIG03). 21C7 antibodies were captured with protein G agarose beads to enrich for SUMO-1 modified proteins. Samples were separated by SDS-PAGE and transferred to PVDF. 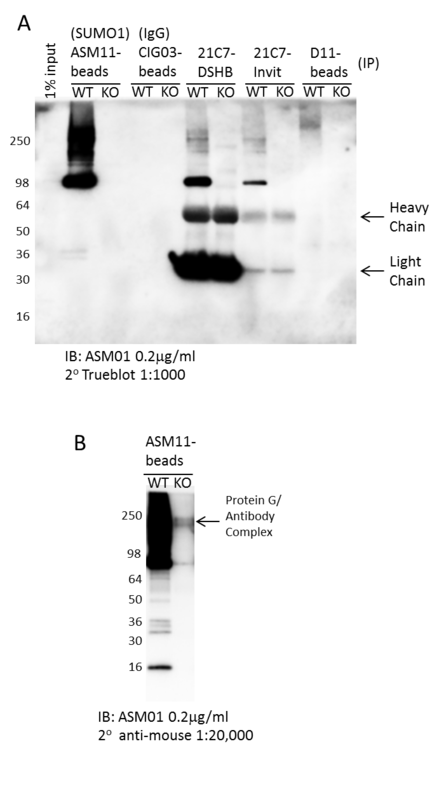 Target proteins: (A) TFII-I, RanGAP1, and (B) schmd1 were analyzed for their SUMO1 modified forms by western blot. Anti-rabbit-HRP labeled secondary antibody was used at 1:10,000. All three primary antibodies are rabbit polyclonal antibodies, and should not bind heavy and light chain fragments from the IP antibody. • Pharmacological investigation of SUMOylating and de-SUMOylating enzymes involved in regulation of target proteins. • Investigate SUMOylation under a variety of different growth factors or drug treatments. • Examine the interaction of SUMOylated target proteins with its downstream effectors. 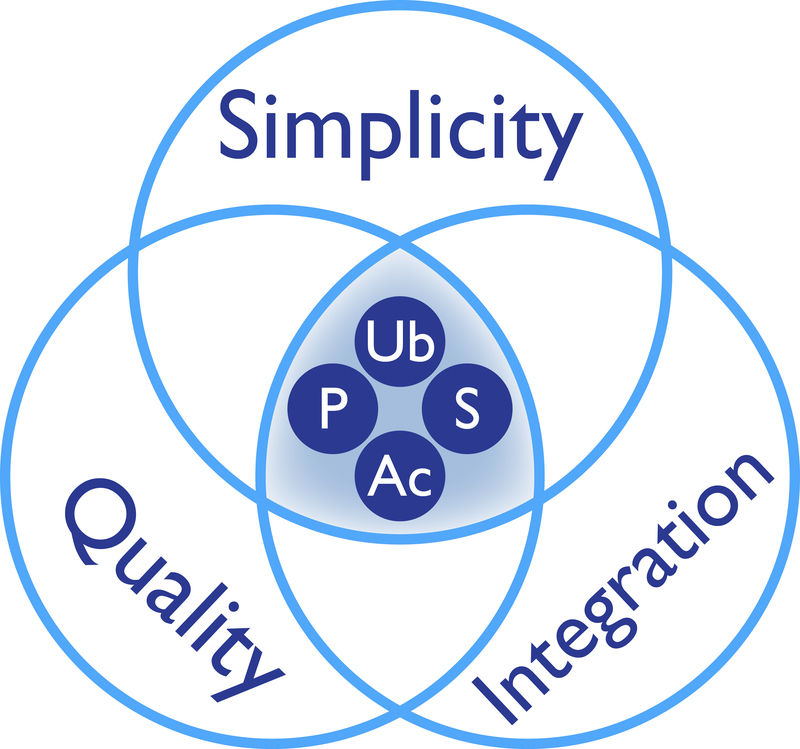 • Examine crosstalk between SUMOylation 1 and other PTMs for target proteins.